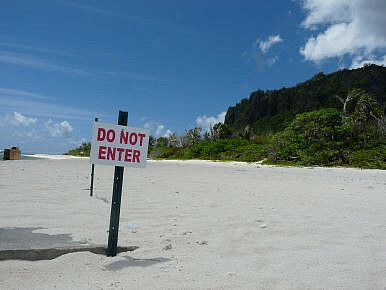 Access is restricted near a live fire range close to Andersen Air Force Base at Guam's northernmost Ritidian Point. Restricted access to land that includes recreational, cultural, and formerly privately owned farming property remains a point of contention on Guam. Compared with Okinawa to the north, which houses over 25,000 U.S. troops, Guam’s military personnel contingent is lean at just over 6,000; but that number will nearly double when 5,000 Marines are relocated from Okinawa beginning in 2022. Regardless, numbers alone belie the depth to which the military permeates the U.S. territory. From the annual Liberation Day parade that marches down Marine Corps Drive to roadways like Army Drive and the Purple Heart Highway to the streets in the capital city named after naval governors and officers, the culture of the U.S. armed forces can be found throughout Guam. For while the U.S. military sees Guam as an indispensable asset, something it owns, many on Guam see the military as a symptom of a greater problem — colonialism. Politically, the United States defines Guam as an unincorporated territory. In United Nations’ parlance it’s a non-self-governing territory. Still others say Guam is a military colony and an unappreciated one at that. “I always have to remind people that Guam may look to the United States and the U.S. may be everything; when just about everybody in the United States looks at Guam, they see nothing. That’s the reality,” says Dr. Michael Lujan Bevacqua, an assistant professor of Chamorro studies at the University of Guam. Guam has among the highest recruitment levels in the nation. Military service is a generations-old tradition for many families, including Chamorros, who often serve alongside an older or younger relative. According to Bevacqua, Chamorros indigenize their military service, sometimes creating such a strong sense of identity that when serving alongside multinational forces (in Afghanistan, for example), others mistakenly assume the Chamorro soldiers represent the (non-existent) independent nation of Guam. 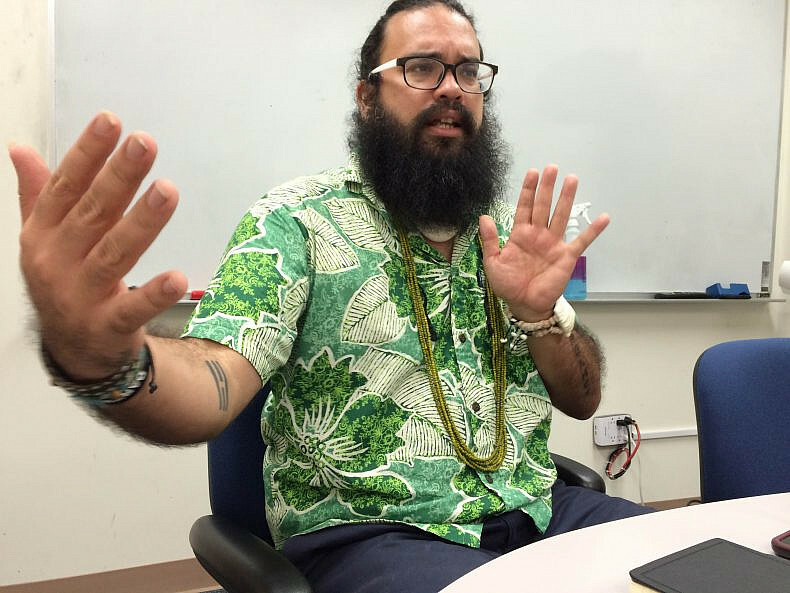 Dr. Michael Lujan Bevacqua says that the affinity many in Guam feel for the United States is not reciprocated to his home, which he says remains a colony of the U.S. Photo by Jon Letman. Guam is headquarters for Joint Region Marianas, which oversees Andersen Air Force Base, Naval Base Guam, and a 984,000 square mile testing and live-fire training area in and around the Commonwealth of the Northern Mariana Islands. Guam is also home to a naval ordnance annex, a naval computer and telecommunications station, home port for fast-attack nuclear submarines and, since 2013, a terminal high-altitude area defense (THAAD) missile defense battery. Chamorro lawyer Leevin Camacho says there has been a noticeable change in the last five years. “The military presence on Guam is definitely more visible now. Every day you see a bomber or a C-130… You almost get used to it.” He’s referring to bomber runs from Andersen Air Force base where, in August, a B-52 Stratofortress, a B-1 Lancer, and a B-2 Spirit bomber made history simply by lining up on the same runway. It was an extraordinary show of strength on an island which could potentially be a launching point for an East Asian military confrontation. Camacho describes economically depressed housing conditions just beyond the fence surrounding Andersen Air Force Base. He recalls a public hearing he attended where one Chamorro man described jets flying so low over his house in the morning that his coffee mug shook and he could smell jet fuel. The two lawyers pivot back and forth reciting a litany of adverse impacts, from a military housing allowance they say makes housing unaffordable for non-military residents to the military discounts for everything from gasoline and milk to baby formula and toilet paper. Aguon adds, “In many young people’s minds the military service is the tried and true road to wealth and well-being and so they quickly get with the program.” With the military dangling financial incentives before Guam’s people, he says, it drives parents to encourage their kids to enlist. “What’s happening now is but one chapter in a long and complicated book about the breaking of a people,” Aguon says, adding that militarization and colonization are inseparable. 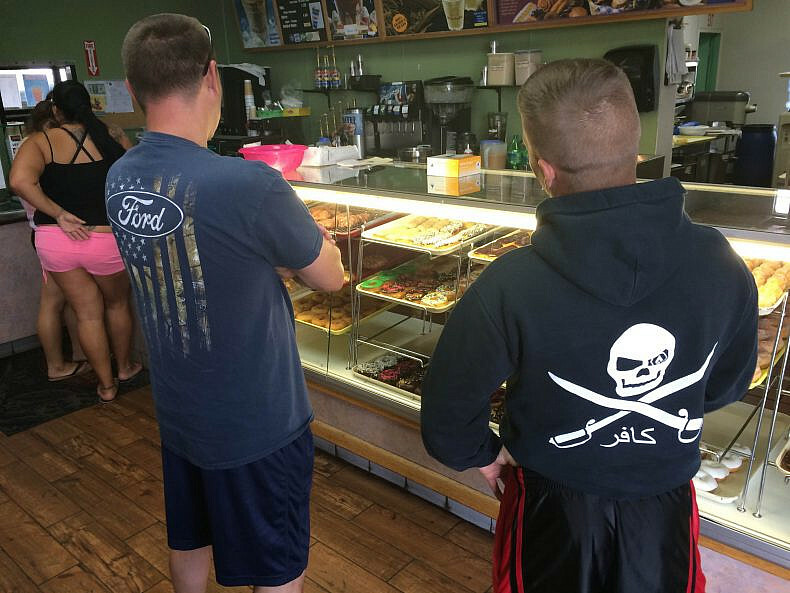 Two soldiers buying donuts at Winchells. U.S. military personnel on Guam will nearly double with realignment of 5,000 marines from Okinawa beginning in FY2022. Proponents say the buildup will be good for Guam’s economy. Photo by Jon Letman. Last March, Bordallo called for the development of an IT business sector on Guam, which she says, through strong military ties, could position Guam as a regional hub for IT infrastructure. “Further, if the Trans-Pacific Partnership is passed I think Guam can leverage its location to take advantage of potential business meetings and engagements to facilitate trade in the region,” she added. Furthermore, Peterson says the military provides vital job skills training and regional security. Peterson points to Chinese-backed real estate development in the nearby Northern Marina islands saying, “If the U.S. left, it wouldn’t be long before China would run everything in Guam.” He suggests Guam’s strategic importance will only increase. 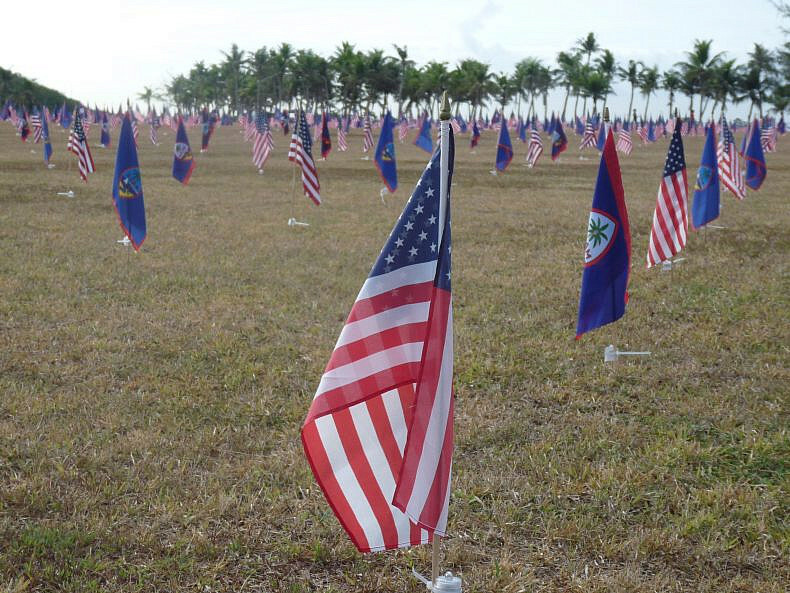 Three thousand American and Guam flags are lined side by side at Asan Beach, one of the many reminders of the bloody battles that killed over 20,000 Chamorros, Americans, and Japanese in World War II. Jon Letman. The notion that the U.S. military is what keeps Guam safe is “very low-level, colonized thinking,” according to Dr. Lisa Natividad, an assistant professor of social work at the University of Guam. She sees the military presence as a source of social and economic stress, saying it “vampires our best” through its universal recruitment in Guam’s schools. When the Navy released a bulging 10,000 page Draft Environmental Impact Statement in 2009, concerned citizens divided up the report for review. Facing opposition and more than 10,000 comments, the Navy scaled back the original plans for 8,600 Marines and deferred controversial plans to dredge over 70 acres of coral reef and to build a live firing range complex at a historical Chamorro site. The firing range was instead moved to the Guam National Wildlife Refuge on the island’s northernmost tip. Victoria-Lola Leon Guerrero is co-chair for the Independence for Guåhan Task Force and a member of the Commission on Decolonization. She helps lead efforts to educate Guam’s public about the three political options it would face in a plebiscite vote: statehood, free association (similar to the Federated States of Micronesia), or total independence. According to Leon Guerrero, business interests on Guam have constructed a false narrative suggesting the whole of the island is supportive of the Marine build up. “Those of us who have read through these [military] documents have realized that there really isn’t much economic gain to be had, especially the way the buildup has been downsized,” Leon Guerrero says. She’s referring to the original announcement that 8,600 marines and 9,000 dependents would be relocated to Guam for four-year stints, during which time they could invest in the local economy and contribute to the community. Instead, two-thirds of the reduced number of Marines will be training on Guam and neighboring islands on six-month rotations. Rather than focusing on how to profit from the military, Leon Guerrero says Guam’s people should be working to build a self-sustaining economy that breaks what she calls a dependency on the military. 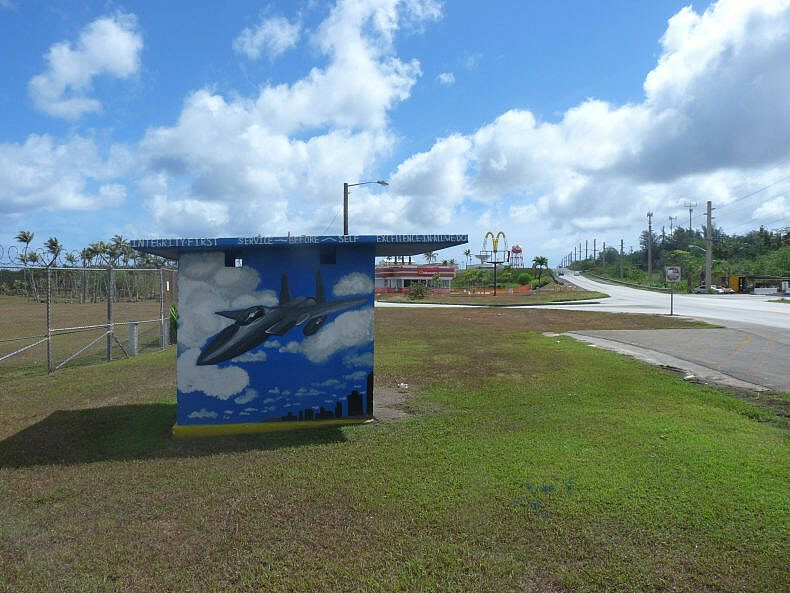 A public bus shelter outside the gate surrounding Naval Computer and Telecommunications Station Guam is painted with slogans and symbols of the U.S. Air Force. Photo by Jon Letman. Dr. Carlyle Corbin, a U.S. Virgin Islands-based international advisor on governance, also teaches a course on political evolution for small island territories at the University of Guam. “Discussion of the fact that the United States has colonies is something that doesn’t resonate, especially… when there is a bit of a denial as to whether it’s a colony,” Corbin says. Meanwhile, Defense Secretary Carter has vowed the U.S. “will remain the principal security power in the Asia-Pacific for decades to come” and the military describes Guam in terms of providing “strategic global strike capability” and “ensuring consistency with force posture requirements.” At the same time, there are growing voices on Guam that demand a permanent and just resolution to what is seen as injustice.